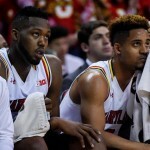 The Maryland Terrapins barely survived a home-scare against Michigan last weekend to end their worst stretch of basketball of the season. With six days without a game, Mark Turgeon was hoping that this three-game stretch to end the season would prepare his team for post-season play. Unlike Maryland who controled their destiny to win the Big Ten regular season, Purdue is playing simply to improve their bracketology seeding following a road loss to Indiana on Wednesday. Rebounding issues reared their ugly head against early and often for Maryland. Purdue had 19 offensive rebound on their 29 missed field goals for 24 second chance points. Despite a flurry from Maryland at the end with full court press, it was too little too late as the Terps dropped their 19th straight against ranked opponents on the road, 83-79. The Terps have struggled in allowing offensive rebounds and being beat on the boards for much of conference play. It was the same script for Maryland today as they got abused in the paint and in the matchup of bigs. Diamond Stone took an early seat when unable to deal with Hammons, who surprisingly knocked in his fifth 3-pointer of the year, but things were not much easier for Damonte Dodd who quickly picked up two fouls in two minutes of play. Purdue won the battle on the glass 11-1 to start the game and converted five offensive rebounds into 12 second chance points. A 12-0 Boilermakers run gave the home team a whopping 24-8 lead early on. As poorly as Turgeon’s squad has been playing, they started to gain confidence and made a game out of what quickly could have turned into a rout. Robert Carter Jr.‘s jump hook and a contested 3-pointer from Jared Nickens got Maryland going on their 15-3 run. Then Diamond Stone began to take over on the offensive end once A.J. Hammons took a seat with his second foul. Maryland’s freshman had six points during the run that cut the deficit to four points and got to double-digits in the first half. Maryland would later cut the Purdue lead to one possession multiple times over the final five minutes of the half but were unable to pull even. Granted a 44-39 deficit at halftime is a lot more favorable than being down 24-8 less than eight minutes into the game. When A.J. Hammons hit his second triple, and sixth of the season, to put Purdue up 74-64 with four minutes remaining it seemed like Maryland was on their way to their third loss and four games. Then Mark Turgeon finally decided to bring out the full court press against the turnover prone Boilermakers. With Jake Layman‘s length and Purdue’s lack of solid guard play from a ball handling perspective, Maryland forced five turnovers in a two minute span. Not only were five of the home team’s six possessions automatically empty with the miscues, but Maryland began getting clean looks at the rim during the transition. The Terps tied the game up at 76 for the first time since the opening tip with a 12-2 run. Maryland was done by two with one minute to play on the road and Purdue had possession of the basketball. The Terps just needed one stop to give themselves a chance for their first lead of the game. Melo Trimble had fought through a Hammons screen to stick with Vince Edwards on the pick and roll and forced a pass late in the shot clock. Dakota Mathias had a career game with 17 points, but a double team by Rasheed Sulaimon and Trimble forces his dagger 3-point attempt to clang off the back iron. Unfortunately, the double team led to an unbalanced floor for Maryland who was not ready to go after the rebound because of ball watching. Johnny Hill came up with the offensive rebound in similar fashion to Matt Costello for Michigan State and doomed the Terps. With five losses in conference play, three in the last four games, it is highly unlikely that the Terps can get a share of the regular season title with Indiana having just three losses. More importantly, Maryland needs to make sure they secure a top four finish in the conference in order to earn a double-bye in the 14-team Big Ten tournament. Michigan State and Wisconsin could both leapfrog the Terps in the standings because of their head-to-head record and record against conference champion (Wisconsin is 1-1 against Indiana and 1-0 against Iowa). Maryland still controls their own destiny in the sense that if they win out they will have a double-bye. With regards to the NCAA tournament, hosting a regional with a two seed is almost out of the question unless they win out including the Big Ten tournament. With today’s loss and possible continued struggles leading up to Selection Sunday, the Terps could even slip out of the three seed line. How disappointing would it be for a team that is arguably the most talented in the country start the big dance with the same starting point as last year with a four seed? Maryland will finish that home portion of their schedule against Illinois on Senior night, Thursday, at 7 pm. 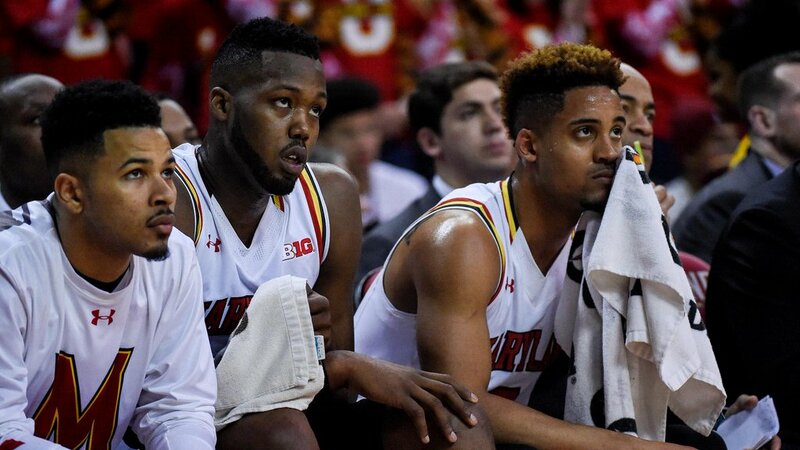 The likes of Jake Layman and Rasheed Sulaimon will certainly be gone because of used up eligibility, but the Terps could also lose the likes of Melo Trimble, Diamond Stone, and Robert Carter Jr. to the NBA. Filed Under: College Tagged With: DAMONTE DODD, Diamond Stone, JAKE LAYMAN, JARED NICKENS, MARK TURGEON, MARYLAND TERRAPINS, RASHEED SULAIMON, Robert Carter Jr.